Metchosin is situated in the Capital Regional District (CRD) 22 km (14 miles) west of downtown Victoria. Metchosin is situated in the Western Communities or West Shore, a commercial, business and recreation association that besides Metchosin includes the Highlands, Langford, Colwood and View Royal. These five communities share various services, facilities and organizations including the RCMP, Chamber of Commerce and the Juan de Fuca Recreation Centre. Metchosin is a rural community, still very proud of its agriculture and farming presence within the CRD. 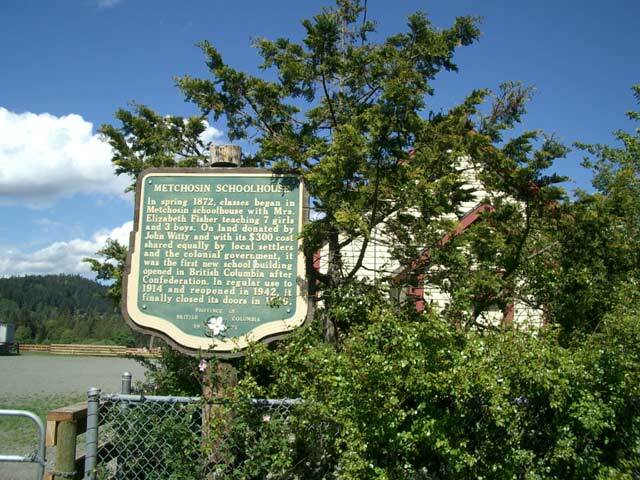 Metchosin is mostly made up of small hobby farms, some featuring equestrian rings or private residential houses with large lots or small acreages. 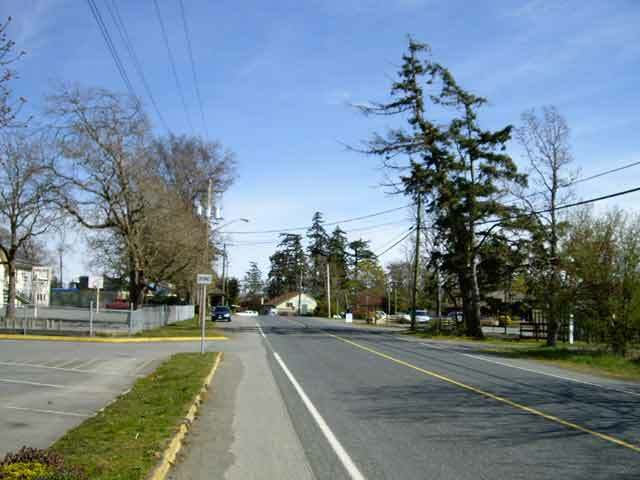 There is very little commercial development in Metchosin except for the main centre found at the intersection of Happy Valley, William Head and Metchosin Roads. Here you can find the Metchosin Country Store, Bickerdike Auto Repairs, Metchosin Community Hall, Metchosin Elementary School, a small strip mall that contains a great little espresso bar called The Broken Paddle Coffee House, Candlelight and Wine, a U-brew style wine store and Pets Plus, a tack and pet store all situated next door to the My-Chosen Cafe. The main centre also contains the district office, volunteer fire department, museum, provincial Stop of Interest sign, Metchosin Museum, and the nearby cemetery. There are some beautiful beach areas along the ocean in Metchosin to visit including three CRD Parks situated at Witty's Lagoon, Devonian Beach and near Albert Head. Witty's Lagoon is the largest and has a number of access points and features a number of wildlife viewing areas, plus a small waterfall and estuary where Bilston Creek empties into the ocean. Besides the CRD parks Metchosin has a number of small private beaches that offer access to long stretches of beautiful scenery along Parry Bay, such as the one at the end of Taylor Road, Most beaches commonly consist or either gravel or pebbles but there is some couple of really nice sandy ones such as the one found off William Head Road near William Head Penitentiary at the end of Sandgate Road called Weir's Beach. 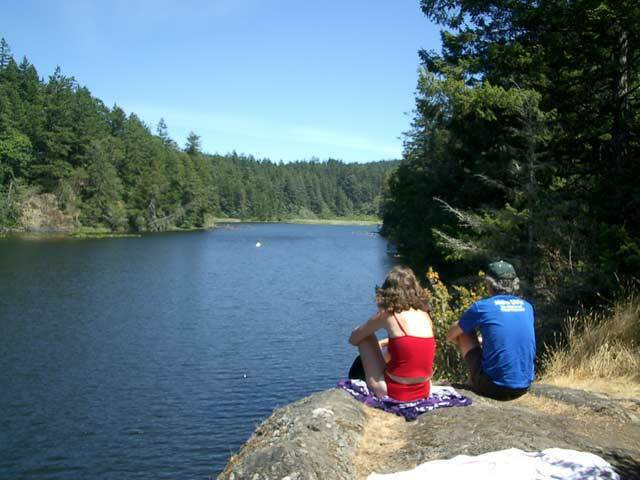 Other trails in Metchosin include the Galloping Goose Regional Trail which takes you either east through Colwood, View Royal through Saanich to downtown Victoria or west through Matheson Lake and Roche Cove Regional Parks eventually to the Sooke Potholes. If you had to choose one section of the Galloping Goose Regional Trail, the 30-40 km stretch starting near Pedder Bay at Rocky Point and Matheson Lake Park Roads is probably the most scenic. Another beautiful place to go walking area and swimming is found at Matheson Lake Regional Park. Located along the Galloping Goose Trail corridor at the end of Matheson Lake Park Road, it features a small kid-friendly beach at one end and a trail that leads you to small private swimming areas along boulders situated along the waters' edge. The water is very clean and warms up nicely during the hot summer months. 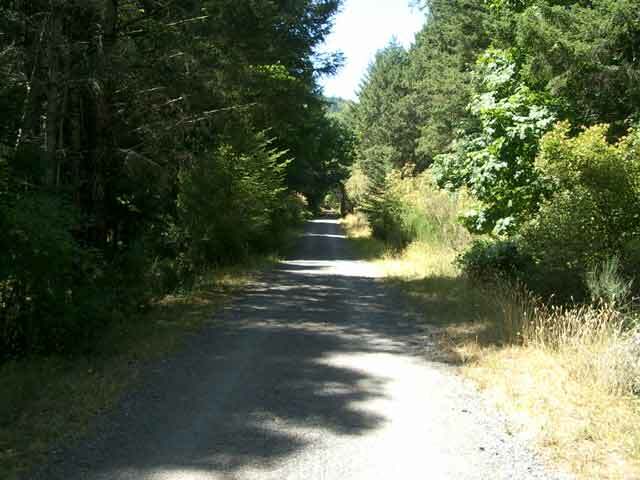 This is definitely a treat if you're cycling or walking along the Galloping Goose Trail. 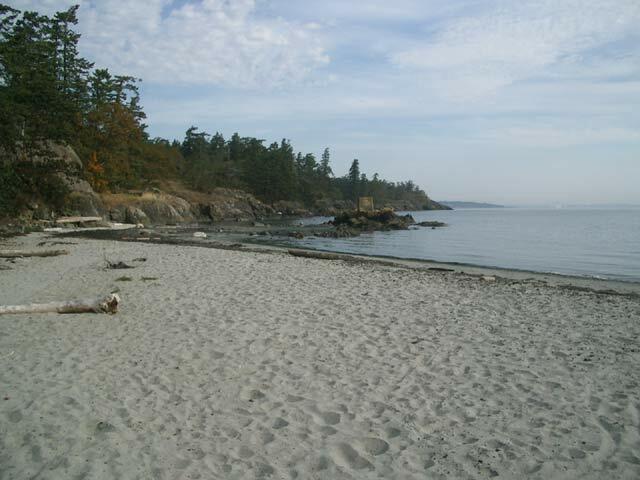 There are other beach areas and parks nearby to Metchosin including East Sooke Regional Park just west of Metchosin on East Sooke Road. East Sooke Regional Park has a number of access points with the Aylard Farm trailhead at the end of Becher Bay Road being the closest to Metchosin. 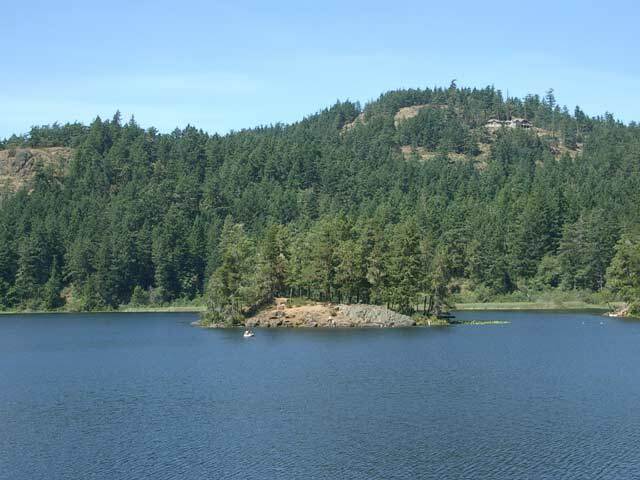 On the way to East Sooke Regional Park at the end of Rocky Point Road is where you'll find the Pedder Bay Marina. Here you can find close access to some excellent fishing holes in the nearby waters. 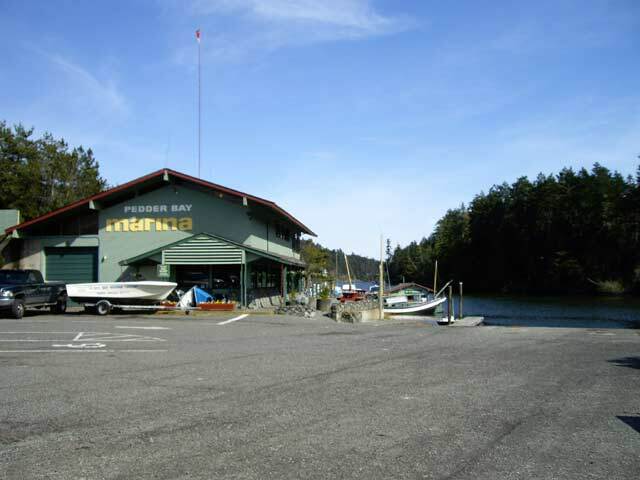 Pedder Bay Marina offers sheltered moorage, fishing guides, fuel dock and moorage. 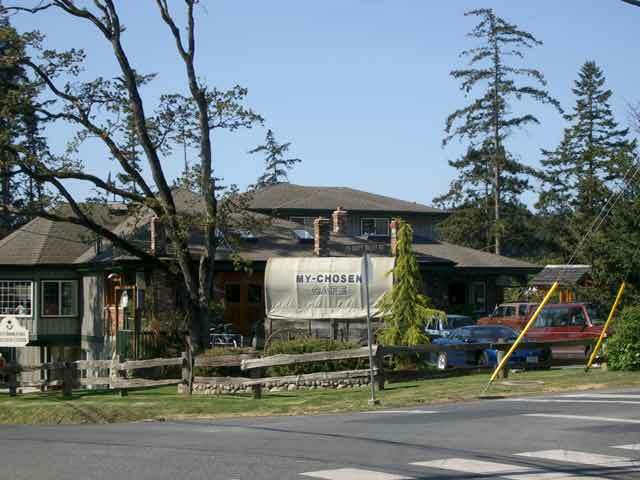 Just beyond the turnoff for Pedder Bay Marina on East Sooke Road is Cheanuh Marina, telephone:250-478-4880. If you happen to be to be in Metchosin and are hungry, make sure that you visit the My-Chosen Cafe This family restaurant is very popular with the locals, serves up large portions, is of excellent quality and you will be very pleased with the home-style cooking and the prices for items found on the menu. For golfers Metchosin has a couple of options for you to play the sport. One is at the Metchosin Golf Course, a very pretty 9-hole course located across from Witty's Lagoon Regional Park at Pears and Metchosin Roads. There is also Green Acres Golf & Driving Range, another public 9-hole facility on Metchosin Road. If you are looking for an 18-hole, Metchosin along with Colwood and Langford share the prestigious Olympic View Golf Course which is found off Latoria Road. Other outdoor recreational activities found in Metchosin include horseback riding, mountain bike riding and ocean kayaking. Metchosin is also home to some property owned by one of British Columbia's oldest motorcycle club the Victoria Motorcycle Club which is found off Happy Valley Road along the Galloping Goose Regional Trail. For RV camping in Metchosin there is a small RV Resort found at Weir's Beach or in nearby East Sooke at Becher Bay called Becher Bay Marina & Campground which does feature the Smokin Tuna Café but is only open seasonally. The only other accommodations are at nearby Bed and Breakfasts found throughout Metchosin.